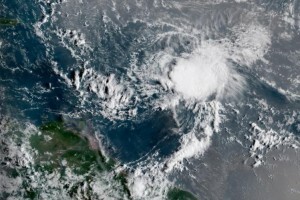 The center of the storm was located 80 miles west-southwest of Dominica and 240 miles southeast of St. Croix, the NHC said in its 2 p.m. EDT update. The storm was moving west at 18 mph and had maximum sustained winds of 45 mph. Forecasters said Isaac will bring several inches of rain to some locations and possibly life-threatening surf conditions. Flash flooding could also occur. A tropical storm warning is issued for the islands of Martinique, Dominica and Guadeloupe, and a tropical storm warning for Antigua, Monserrat, and St. Kitts and Nevis. Little change in strength is expected as Isaac leaves the outer islands and heads for the eastern Caribbean Sea. No coastal watches or warnings are in effect in the United States, and the NHC forecast track shows the storm heading west towards Central America. It is not expected to impact the United States coast.